Ah, fall. Pumpkin spice lattes, cool breezes and everyone’s favorite sleep-inducing holiday—Thanksgiving. Thanksgiving is quintessentially fall. We pull on our boots, wrap a scarf around our neck, and head out the door to spend time with family and friends. We eat past our heart’s content and pretend to make up for it by throwing a football in the yard. It’s relaxing and wonderful. So wonderful, in fact, that we sometimes forget the point of the day: to be thankful. To pause, look at everything we have, and see it all as a blessing. This year, if we can recognize that we don’t deserve what we’ve been given, then maybe—just maybe—we’ll be moved to compassion and then action toward people in need. The best part is: You don’t have to sacrifice fun or fellowship to be generous with others. Below are 10 simple ways you can pay it forward this holiday season. So, grab your family, your friends, your coworkers, or your small group from church or Financial Peace University, and get to giving! Plan a scrumptious Thanksgiving meal complete with all the fixings, and determine how many families your group can feed. Then, contact a local food pantry for a list of families in need. Spend a Saturday shopping, cooking, and delivering the meals together. 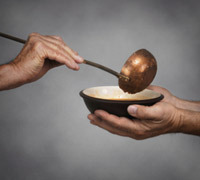 Serve at a soup kitchen for the perfect Thanksgiving reality check. Sign up ahead of time to make sure you can go as a group, and show up the morning of to give a warm smile and meal to people who rarely receive either. Use Black Friday to benefit others. Instead of frantically crossing items off your family’s wish list, go as a group to buy clothing items for people in need. Take advantage of the good deals, and donate your finds to a local homeless shelter. Show love to your community by spending the afternoon cleaning it up. Depending on where you live, this might include raking leaves or shoveling snow. End the night with a chili cook-off that the whole neighborhood’s invited to! Collect coupons as a group to stretch your dollar at the grocery store. Then, donate the goods to a local food pantry the week of Thanksgiving. Be sure to throw in a few special treats for the holiday. Write notes of gratitude to soldiers from your community who are spending Thanksgiving overseas. Put in a box full of basic necessities, fall candies and a calling card so they can connect with family at home. Collect toys in anticipation of the Christmas season. Encourage your kids to give up a certain number of gently used toys in order to bless other kids who do without and to make room for new toys that are sure to come their way. Repair a heating unit for a family in your community. Getting those fixed can be pretty pricey—an especially heavy burden during the holidays. Gather a fund and have it ready for this inevitable crisis. Collect sweaters, scarves and coats and distribute them among your group. Keep the items handy in your car and be on the lookout for homeless in your city. When you see them, you’ll be able to pass along a bundle of warmth without hesitation. Set aside extra cash at the beginning of the month. Give a generous tip to your waiter, the person at the checkout counter, the grocery bagger or your hair stylist. When you give, do it with a welcoming spirit and a humble heart—remembering all that He’s given to you. Let’s make this Thanksgiving season one that’s full of authentic and active gratitude.